European Super-Bantamweight champion Kiko Martinez has withdrawn from his fight with Carl Frampton on September 10 in Belfast, Northern Ireland. Carl Frampton's fight for the European super-bantamweight title against Kiko Martinez in Belfast on 10 September is off after the Spaniard pulled out. 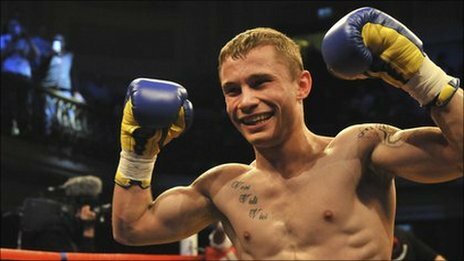 The champion has withdrawn from the Odyssey Arena showdown because his father is seriously ill.
Belfast fighter Frampton landed the title shot despite having had only 10 professional fights. A possible replacement for Martinez is Limerick's Willie Casey, a former European title holder. Casey relinquished the European belt before losing to Cuba's Guillermo Rigendoux in a WBA title fight in March. Martinez's record includes a stunning first-round knockout of Bernard Dunne in August 2007. The Spaniard is in his third stint as European champion. Martinez knocked out Bernard Dunne in the first round of a European title fight in August 2007 but then lost the EBU belt when outpointed by Rendall Munroe the following March. However, he regained the European belt in April when he knocked out Jason Booth in the 10th round in Madrid. Frampton's planned bout will be the chief support fight to Paul McCloskey's contest with Breidis Prescott.